Fourth Row Center: Film Writings by Jason Bailey: In Theaters: "New York, I Love You"
You don’t see a lot of sequels in the world of independent cinema, but when the star-studded, multi-director anthology film Paris Je T’Aime was a sleeper art-house hit in 2007, the wheels were quickly put into motion for a follow-up. That film’s premise—multiple stories of love in the city of light—could easily be transposed to other urban centers, stocked with new actors and directors, and presumably replicated with ease. So now we have New York, I Love You, a compilation of eleven love stories (plus transitions) from Gotham. As with most sequels, it’s not as strong as its predecessor, and the slate of filmmakers is considerably less impressive. But it has its moments. Things get off to a rough start with the Chinatown segment, directed by Chinese actor-turned-director Jiang Wen. It’s not entirely his fault; the concept is clever and the story has some fine dialogue. The trouble is the casting. “Ugh,” I jotted down in my notes, “Hayden Christensen is going to ‘play a character’.” I’ve never been a member of the Hayden-haters club; he’s good in Shattered Glass, and I’ll bet DeNiro couldn’t even do anything with that Lucas dialogue. But he’s just awful—using a horrible put-on voice for his dull line readings, he’s so bad you’re embarrassed for him. And then Andy Garcia shows up and just acts circles around the poor schmuck. 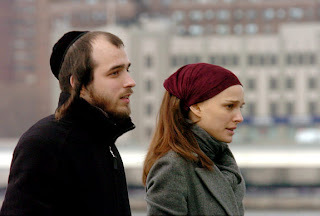 Next we go to the Diamond District for Mira Nair’s piece, an unlikely intimate connection between an Indian diamond seller (Irrfan Khan) and a Hasidic bride-to-be (Natalie Portman). I’m not quite sure I bought her Yenta voice, and the story turns a bit too quickly and sharply (it may have needed to be a couple of minutes longer). But the two actors have an interesting dynamic, and the story is at least unpredictable. The surprise of the film is found in Japanese director Shunji Iwai’s Upper West Side segment, and that is that the usually insufferable Orlando Bloom is actually quite good as a frustrated film composer engaged in a telephone flirtation with his director’s assistant (a well-utilized Christina Ricci). It’s a sweet and lovely section, with an inspired ending. Yvan Attal’s story comes in two parts (one at this point in the film, one later), each concerning an out-for-a-smoke connection—the first couple played by Ethan Hawke and Maggie Q, the second by Robin Wright Penn and Chris Cooper. Both pairs are very good together, trading their sharp, snappy dialogue with aplomb, though the little twist at the end of the second story is more predictable than in the first. The Central Park story is next; it comes to us from Brett Ratner, and as much as I hoped he might raise to the occasion, it nearly sinks the entire film. Let’s go back to my notes: “Is this supposed to be funny or what?” His tale of a young man taking a girl in a wheelchair to prom is absolutely tone-deaf and rather repulsive—it wastes some wonderful actors (James Caan, Anton Yelchin, Olivia Thirlby, Blake Lively) at the service of what amounts to an enactment of an old dirty joke. Luckily, the Greenwich Village segment (from Menace II Society co-director Allen Hughes and screenwriter Xan Cassavetes) is one of the film’s strongest; it’s perhaps a touch overwritten in its opening moments, but is quietly stylish and has a great, wordless payoff. The Upper East Side segment was written by Anthony Minghella, who was to direct it before his untimely death; Shekhar Kapur (Elizabeth) took the reins, and while the story behind the story is compelling, the same can’t be said for the piece itself. Kapur makes fine use of his cast (Julie Christie, John Hurt, and Shia LaBeouf), but boy is this one overwrought—and pretentious, what with all the billowing white curtains and sad cello music. It’s the first watch-checker of the film. Next, Natalie Portman returns to the film, this time as a debuting writer/director; her short easily measures up to the more experienced filmmakers, telling the tale of a little girl (Taylor Geare) and the black man caring for her (Carlos Acosta) with an off-the-cuff feel, a tender mood, and a sophisticated trick of construction. German director Fatih Akin’s Chinatown story is vividly drawn (Akin’s tight close-ups are well-composed), though the story is slight, even by short film standards. After the second part of the Attal film, we arrive at the final section, a Brighton Beach story directed by Joshua Mastron (who did the excellent Maria Full of Grace). As with Paris, Je T’Aime, they end with arguably their strongest piece, which finds Eli Wallach and Cloris Leachman as Abe and Mitzie, a longtime couple out for a walk on their anniversary. Their back and forth is wonderful (like a good Neil Simon play), the final beat is just perfect—and then they top it. There are a couple of new issues with this latest installment. First and most distressingly, these eleven stories from one of the most socially progressive cities in the United States all concern straight couples. It’s a bit of a shock; the Paris film at least gave us the Van Sant short (even if it was a bit of a throwaway). I’m not trying to assert some kind of a “homosexual agenda,” but seriously, I live in New York, and to pretend like this city isn’t teeming with gay romances is just plain crazy. The other problem is that they can’t leave well enough alone; the Marston film is a perfect conclusion (as Alexander Payne’s segment was in Paris, Je T’Aime), but they keep going for a couple more minutes, using a video installation by one of the “transition” characters to try and tie everything together, not realizing that they’ve already passed the ideal ending. Ah, well. New York, I Love You still has much to recommend, and if it’s a little bit bumpy, that’s rather par for the course. "New York, I Love You" opens Friday, October 16 in limited release.